No matter what kind of guitar you play… acoustic, electric, elec/acoustic, etc. No matter what style of guitarist you happen to be… classical, country, rock, pop, soul, jazz, reggae, heavy metal shredder, etc. There is one amplifier that will satisfy your need at home, a small live music venue, the beach, the park. It doesn't matter. This baby runs for up to 15 hours on SIX (6) AA batteries! (or the included AC power cord). 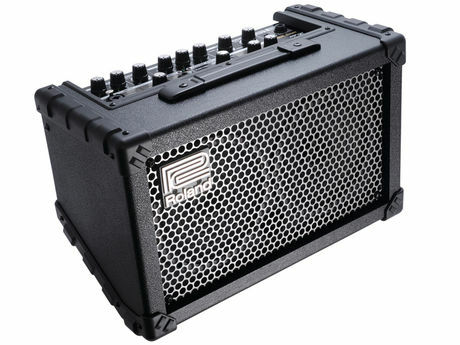 The Roland Street Cube can handle the smaller to medium size venues without a hitch or a hiccup. It has seperate channels for your mic and guitar, AND separate effects for each channel, too! Believe me… I don't need to write a lengthy review on this, because almost every review you'll find online for the Roland Cube Street, praises it more than the next one! What IS the Roland Cube Street and what does it do? Briefly, it's a small practice - sized PA system/ stereo amp that is very popular with buskers and singer/guitarist who play smaller venues and like to travel light. It's also great for outdoor areas where there is no electricity, because it can be completely battery powered. Unlike some amps that have to be recharged constantly - you're never far from a power source for this. If you're batteries are running low on energy, you can stop in any convenience store and buy six new batteries that will last for the next 3 or 4 gigs. The Effects on this are GREAT!